June is Dairy Month, so throughout this month we will have dairy inspired recipes and articles. 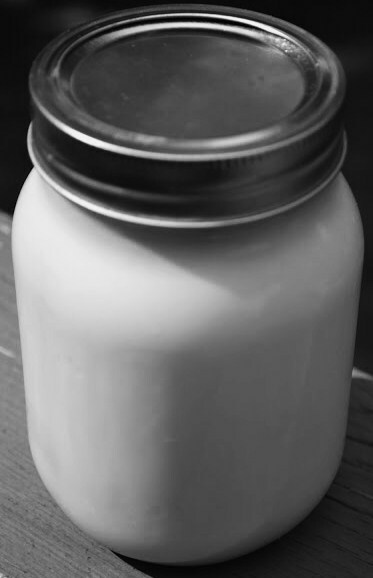 Let’s start with our morning pick me up, Vanilla Coffee Creamer that is made and stored in a mason jar. Many people love coffee creamer but the cost to buy it can be very expensive and the calories and sugar content can be very high. 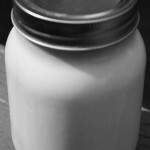 This Vanilla Coffee Creamer recipe only costs pennies to make and by choosing your dairy and sweetening ingredients you can make your own health choices. Pour all ingredients into the mason jar. Close the lid and shake. •Write the expiration date of the milk on the lid, since this will apply to your vanilla coffee creamer (Use these chalkboard labels). •For a sugar free alternative use 14 oz. "unsweetened" condensed milk / evaporated milk and 6 stevia packets, instead of condensed milk. •This is a nice gift for any coffee drinker. 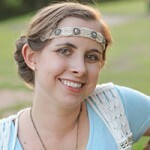 Krista is a self-proclaimed “health nut” and eco-friendly enthusiast. its not sugar free with sweetened condensed milk in it!!! I just wanted to let you know that it says “and” sugar free alternatives because Krista gives the option to go sugar free in the recipe. Thanks for your comment. Even the ‘sugar free alternatives’ are NOT sugar free! Evaporated milk DOES have sugar in it. This should be labelled ‘no sugar ADDED’. The reason Evaporated milk shows it to have sugar under the nutrition is because it is a dairy product. If you look at your milk container it will show it as well. Milk has lactose in it, which is a natural type of sugar. I call this alternative recipe “sugar free” because that is what the majority of people refer to when no sugar is added, despite some natural occurrences. If this was a product I was selling in stores, legally it meets with FDA standards since sugar free products can’t have sugar added and naturally occurring sugar has to be less than.5g per serving. If you don’t feel comfortable using evaporated milk in place of the condensed milk, use the 6 stevia packets that I mentioned. Stevia is a natural sugar free sweetener. Research shows that it doesn’t raise blood sugar and in some cases can lower it. No habia visitado tu sitio web por un tiempo, porque me pareció que era denso, pero los últimos posts son de buena calidad, así que supongo que voy a añadirte a mi lista de blogs cotidiana. Te lo mereces amigo. Next post: How Much Does Your Purse Weigh?